Oriental rugs add a uniqueness factor when placed in a visible area of any type of space. These rugs are known to be designed with intricate colors and patterns, which have influenced generations upon generations of people, cultures, and even different religious groups; and because of this, oriental rugs are prized higher by most home decorators. There is a similarity between oriental and commercialized rugs. Both rugs accentuate and tie in any given space to bring it together, and are almost made of the same materials such as silk, cotton, and wool. Oriental rugs however, do not go through the same creation process of commercialized rugs, because most of these rugs are woven and handmade. Because they are created differently, oriental rugs do not respond well to conventional cleaning processes. These rugs demand a very different, and very strict process, when it comes to getting them cleaned. If this type of rug is not taken care of properly, it may tear, unravel, and slowly fade, losing its artistic value and design. Do not be intimidated by the rug’s reputation. Though the cleaning process takes a little more effort than cleaning commercialized rugs, it is very easy and simple to follow. To save yourself the trouble of removing impossible stains in the future, take care of them straight away. Leaving the blemish on the rug longer may discolor the affected area, and rapidly damage the rug’s quality. When dealing with stains and blotches, however, you must not rub it out. This will cause the fibers of the rug to mat. Instead, cover the affected area with a clean towel or a pad of paper towels and begin pressing down with the heel of your hand. By responding to the stained area quickly, you are also saving yourself from hiring professional cleaners. When vacuuming or displaying the rug, keep in mind that an occasional flip of the side will help the rug’s lifespan. Some commercial rugs have only one side to display its design. 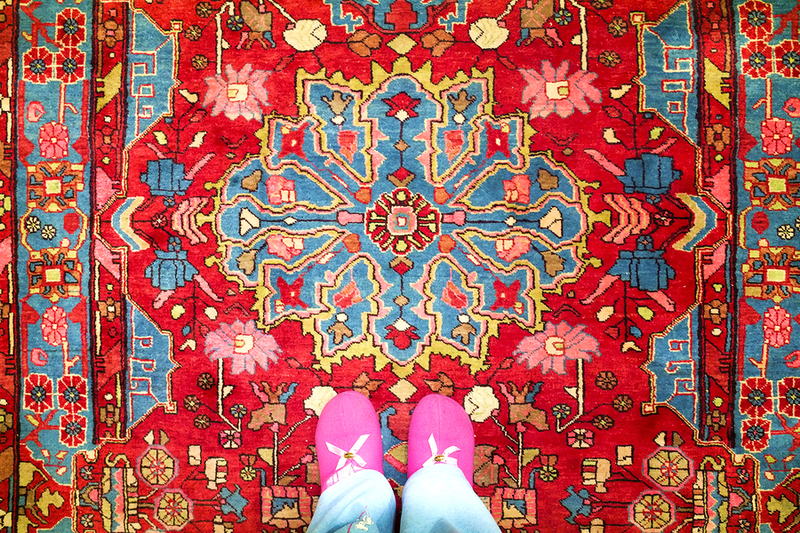 Since oriental rugs are made traditionally however, its design can be seen in both sides. Flipping your rug in a regular basis prevents overly damaging one side of the rug from sunlight and everyday use. As for the vacuuming process, it is advised to pick up the rug, and pat it gently to release collected dirt and dust. After that is done, you may proceed to vacuum both sides, to ensure that all the unwanted filaments have been removed. Oriental rugs are made with vegetable dyes. Vegetable dyes is a natural coloring agent, and when it is mixed with chemicals found in cleaning products and soap, it will induce discoloration. A concoction of water and vinegar is as effective and a tamer mixture when it comes to Oriental rug cleaning. When using this concoction, lightly spray the rug and leave it to dry. Do not do anything while the drying process. If the rug has fringes that are colored pure white, use less vinegar and dry it by using a fan. While using a light brush, work your way through the fringes. Brushing regularly, keeps the rug from being unmanageable or entangling from one another. Think of it as brushing someone’s hair. To dry soaked rugs, place put it in front of a floor fan instead of hanging or leaving them to dry. If left to sit on hard floors for a long period of time, they have a higher change to mildew. While rugs that are hung and are still dripping, will cause color runs. If it is damp, however, hanging is allowed. Simply reminding yourself that an oriental rug is at its best when kept clean, will make it easier to maintain. Create rules such as no shoes on the rug or do not eat on the rug; but if it can’t be helped but to step on the rug, place sturdy doormats at all entries to limit the dirt it comes in contact with. For really impossible stains and blotches, calling companies that specialize in carpet cleaning, and the like. Professionally having it clean will save the rug from looking overused or disfigured. A little more does go a long way. Though oriental cleaning takes a little more effort and care, the results always make it look better than when it was first bought. Using the right steps will make them age with flare, and make them last longer.